The Wide Open Harley-Davidson Heritage Softail Deluxe fairing attaches to your factory quick disconnect windshield brackets and you must have the stock Headlight for the fairing to fit your bike. This fairing works with running lights. Handlebars: Ape handlebars will not interfere with the fairing, however, the handlebars will be closer to the fairing at the top. They need to be in line with the fork tubes and not pushed forward. 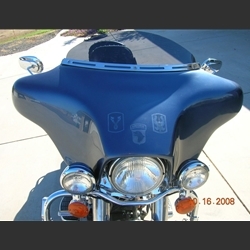 The bottom width of the handlebars can't be more than 15" across; this will make the handlebars hit the inner speakers.